InfoTrack offers a comprehensive national range of land property searches and certificates through our property search functionality. Our system guides you through the process of ordering a property search with the least amount of steps and data required for entry. From titles, plans and dealings to property certificates, InfoTrack has you covered. 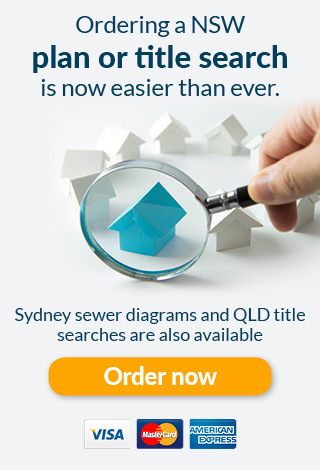 You can also order one off title searches, plans and sewer diagrams online with your credit card here. Property Search bulk ability as well as a copy & paste option of up to 50 titles at a time with free verification of address and proprietor (NSW/VIC/QLD). Ability to view dealings list at the time of ordering titles (NSW/VIC). Pre-population of details for Property Searches and Certificates (NSW/VIC/QLD). Pre-select options for commonly ordered property certificates. National Property Ownership Search – complete one form for national index search of all Australian Land Registries. Property Ownership Searches are also available in NSW, VIC, QLD, SA, WA & TAS. InfoTrack provides you with an easy and efficient way to submit your NSW Electronic Notice of Sale (eNOS). Due to our automated internal systems and processes, 89% of all certificates processed by InfoTrack are processed and submitted to Authorities in real time, this allows for a far quicker certificate return than our competitors. Easy access to all State and Territory Land Registers. We will save 30% of your time when ordering searches due to our sophisticated and advanced search facility. We believe we have the fastest certificate return in the industry meaning you are able to prepare your contracts in a timely manner and increase efficiencies. Support from InfoTrack's next generation HelpDesk, iSupport. Seamless eConveyancing workflow when ordered with your eCOS (Electronic Contract for Sale), or Section 32 and Electronic Contract of Sale of Real Estate. Pending results: Any results that are yet to be returned. CRR results: Any CRR’s that have been returned. A tick here means that the result has been returned clear. Council results: All council certificates are grouped once returned from the authority. Other authority documents: Any other authority will be grouped together once returned. When multiple titles have been ordered for an address with multiple assessments, a tile will reflect all of the titles as a whole and will only tick once all items are returned clear.